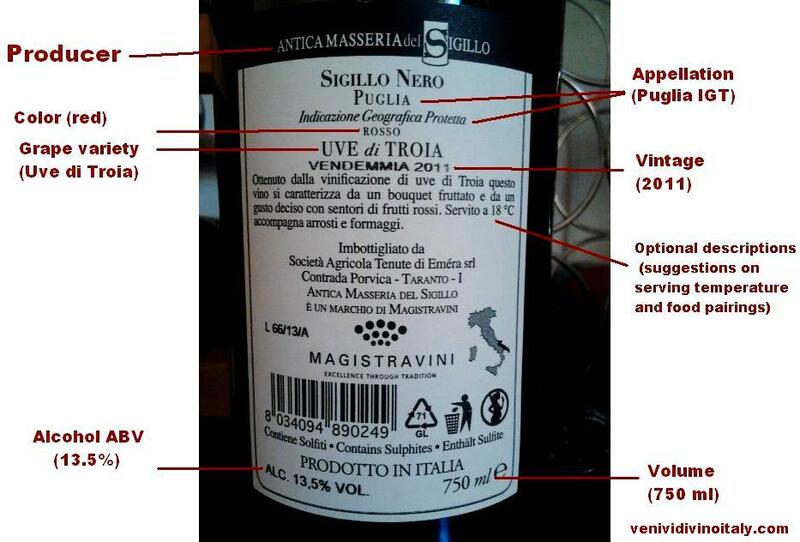 There’s a lot of info on those labels, and being in Italian certainly doesn’t make it look less mysterious to non-Italian speakers… However the good news is that with respect to world wine labels, Italian labels are relatively easy to understand once you know how to decode the terms and legal categories (which I cannot say for some other countries like France which demand a lot more studying to be understood). Alcohol content– ie. 14% or 13.5%. EU regulations allow a certain amount of estimation or rounding up or down here, meaning a wine with an actual alcohol content of 14.3 might be labeled either as 14% or 14.5%. Volume– your typical wine bottle is 750 ml of liquid. Vintage– “Vendemmia” in Italian, the year the grapes were harvested and made into wine. Though this might seem obvious not all wines in the world have this requirement, for example in the Champagne region of France where wines might be a blend of a few different years (in which case they are often labeled “NV” for non-vintage). Color*- Not required* but often an indication of color is included, such as Rosso (red), Bianco (white), or Rose’. Appellations of Italian wines: VdT, IGT, DOC, and DOCG. This classification system was first introduced in the 1960’s in order to better control production and quality. The model followed the French appellation system established in the 60’s as well. All categories specify which grape varieties are permitted in a given area/region but other restrictions and rules vary quite a bit after that. VdT= Vino da Tavola, or literally “Table Wine”. This is the lowest designation for Italian wines and the majority of wines produced fall under this category. The wines must be made using only approved grapes varieties (ie. Sangiovese, Colorino, Trebbiano, Merlot, etc) but there are not requirements on percentages of certain grapes within the blend and there are less restrictions on the growing and vinification (=wine-making) process. VdT wines can be made from grapes grown in multiple regions and the region(s) or grape(s) don’t need to even be mentioned on the label. In the 1970’s and 80’s innovative wine-makers chose to make wines falling into this appellation in order to have flexibility in their wines, resulting in the highly prestigious “Super Tuscan” wines (a nickname that stuck) and eventually the introduction of a new wine category: the IGT. IGT= Indicazione Geografica Tipica, meaning something like Indicated Geographic Region. This category was introduced in the 1990’s in order to incorporate wines which didn’t fall into the DOC or DOCG categories but were not fairly represented with the lower aforementioned VdT category (a concern directly brought on by the wildly loved “Super Tuscan” wines of Tuscany). This category specifies a geographic area (often times an entire Italian Region like “Toscana” or “Lazio“). IGT wines are made entirely of the area’s permitted grape varieties and may also specify on the label which varieties (though generally only the principal varieties of the blend are named and not necessarily all that were used). IGT wines may include both native Italian grape varieties, like Sangiovese in Toscana, as well as international grapes, like Merlot from France. The main focus here is REGION, not varieties, however. DOC= Denominazione di Origine Controllata, meaning “Controlled designation of origin” is one of the top appellations in Italian wines. Often characterized with an extra purple or yellow label around the top of the bottle, this category has lots of rules to follow and requirements to meet. Wines labeled DOC mean that a wine is made according to the traditions and rules within a specific geographic/legally designated viticultural zone (ie. Chianti, Soave, Barolo, Valpolicella, Alba, etc). Wines are made with specified grape varieties, often within specific percentages, as well as grown, harvested, vinified and bottled on site or within the legally designated area. Further, there are strict regulations on the amount which may be grown or produced (the yields) in order to prevent overproduction and therefore poorer quality wines as well as strict rules on practices considered less natural or traditional such as irrigation. Depending on the wine, some DOC zones require specific amounts of ageing in specific types of containers (ie. barrique, or botte) before release. Also, in general producers cannot sell their grapes they have grown to other producers – usually – and if they do the buyer cannot label their wines as being from that DOC zone unless they fall within the area and follow all the above-mentioned rules….this is to prevent people from selling “Chianti DOC” or “Prosecco” made somewhere else entirely like California, one of the key concerns that fueled the French to create this entire system to begin with! Does that sound confusing? Let’s break down the requirements of a particular DOC wine: Valpolicella DOC, a wine from the Veneto region. For a bottle of wine to be labeled Valpolicella DOC it must be made of only permitted grapes grown, harvested, and vinified in the Valpolicella designated zone. The principal grapes are Corvina Veronese, Rondinella, and Molinara (with a minimum of 70% Corvina required in the blend) but other permitted varieties may be included. Grapes must be able to make a wine with a minimum of 11% alcohol by volume (a requirement related to grape quality since adding alcohol or grape spirits is not allowed). The finished wine must be bottled on site where it was grown and vinified. There is no requirement of grapes being mentioned on the bottle or their percentages. Irrigation practices are not permitted except in case of extreme weather conditions such as major droughts. Spraying for fungus or pests must stop before September. These are the principal rules for a bottle of Valpolicella DOC! 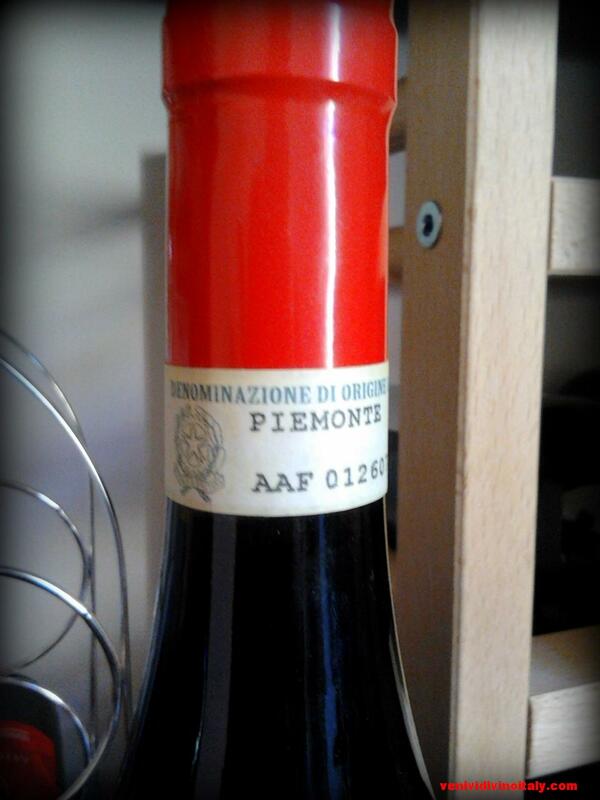 DOCG= Denominazione di Origine Controllata e Garantita, meaning “Controlled and guaranteed designation of origin”. This is the highest category in the Italian appellation system and as such accounts for the least amount of annual production. It’s essentially the same rules and requirements of the DOC designation but often with stricter requirements in terms of yield restrictions, grape maturity, labeling (numbering systems are important to prevent counterfeiting) and wines must pass quality control tastings by a panel of experts. 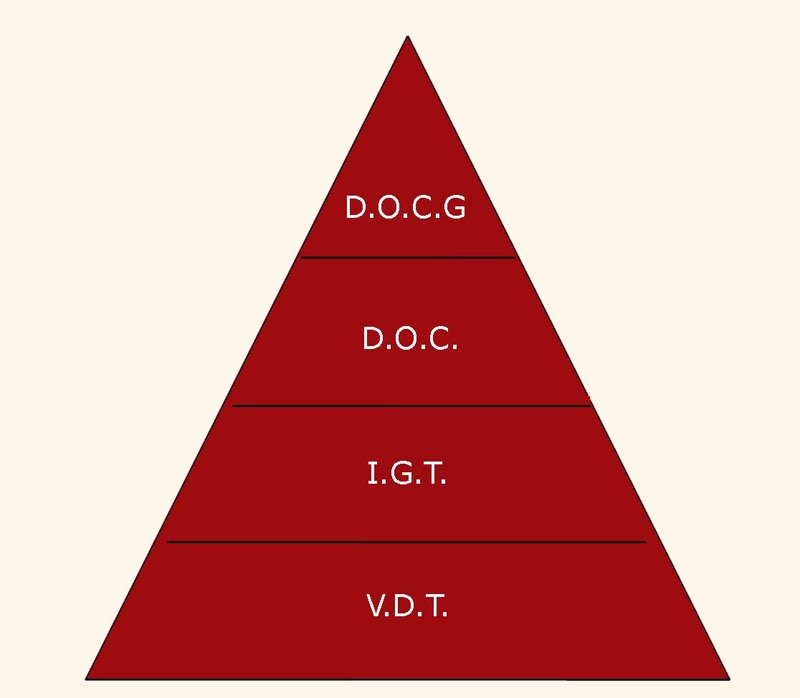 It should be noted however that: DOC and DOCG wines are not automatically “better” wines than their IGT counterparts, despite their higher spot on the category pyramid. The less rigid set of rules for IGT wines gives the wine maker much more creative license in the wines they choose to make. After all, some of the most appreciated wines of Italy don’t fall under DOC/DOCG categories! The rules and regulations of the DOC/DOCG categories are becoming more flexible though, as new appellations are created, as some viticultural areas are starting to extend borders or allow international grape varieties to be used, and as requirements change in blends all together. Classico= refers to the “classic” area of a viticultural zone, the oldest part and often considered the best area (ie. having the best slopes and sun or weather conditions). Chianti Classico DOC on a label therefore tells us that a wine is from the oldest part of the Chianti zone, versus a bottle labeled only Chianti DOC which would be in a later addition to the Chianti area. Superiore= refers to a higher level of quality/maturity of the grape(s) used. For example a Orvieto Superiore DOC means that the grapes used were higher in quality, with higher sugar ripeness and therefore able to naturally produce a wine with a higher level of abv (alcohol content). It’s not uncommon to see Classico and Superiore used together, ie. Valpolicella Classico Superiore DOC. 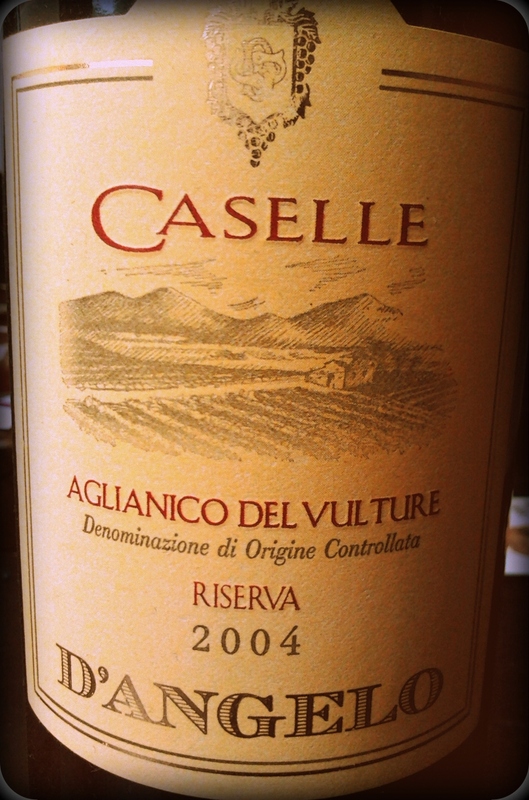 Riserva= A label saying Riserva means that a wine went through a longer than required ageing period. It can mean a higher price since it meant a winery had to hold on to a wine longer, not to mention that barrels don’t always come cheap! Descriptions and Suggestions= Sometimes a label will include a brief description of color, aromas, serving temperatures (in Celsius), and food pairing ideas. Sweetness or Bubbly Descriptions= Terms like “Frizzante” or “Spumante” for example will tell us a bottle is not still but sparkly. Terms like “dolce” will indicate a sweet wine, “Secco” a dry wine, and “Amabile” a wine that is somewhere between dry and sweet. Similarly, terms like “Vendemmia Tardiva” (late-harvest) or “Passito” (a method of production used for sweet wines) tell us that a wine is sweet. Even if there are requirements for percentages of grape varieties in some Italian wines (ie. Barolo must be 100% Nebbiolo, and Valpolicella must include a minimum of 70% Corvina), there aren’t any requirements to name them on the label. However some wines are helpfully named in such a way that includes the variety and place. 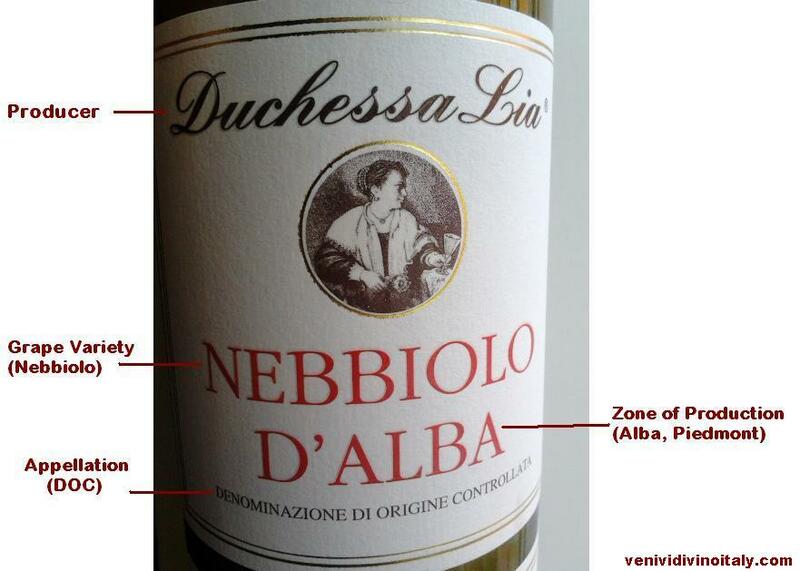 For example: Barbera d’Alba is wine made principally from the Barbera grape in the viticultural zone of Alba. Morellino di Scansano is a wine made primarily (or entirely) of the grape Morellino (aka Sangiovese) in an area called Scansano. Within the EU, bottles with labels naming a grape variety must include at least 85% of the named grape(s). This entry was posted in Italian Wine FAQ, Uncategorized and tagged Aglianico, Appellations, Barolo, DOC, DOCG, Dolce, dry wine, Frizzante, Grapes, IGT, italian grapes, Italian Wine, Italian Wine Labels, Italian Wine Regions, Italian Wine Terms, Nebbiolo, red wine, Sangiovese, Secco, Soave, Sparkling Wine, Valpolicella, VDT, Vendemmia, Vendemmia Tardiva, Vino, White Wine, Wine FAQ. Bookmark the permalink.